Finding My Virginity: Summer 2014 Book Challenge: Three Months Down, One Month to Go! 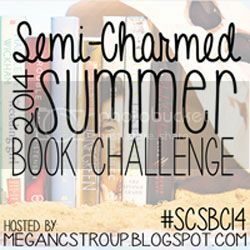 Summer 2014 Book Challenge: Three Months Down, One Month to Go! I did not do nearly so well with my reading in July as I did in May and in June. This month I need to hustle and read four books if I want to complete the Summer 2014 Book Challenge. Here is what I did manage to read last month. This month I will read the entire Divergent trilogy, which should count towards a book read by another blogger for this challenge, a book being made into a movie, and a book on the NYT bestseller list. Then I just have to find a book written before 1987 that I want to read! I also want to take a moment to thank all of you for your overwhelmingly kind and supportive response to my three-year blogoversary and announced changes. Book reviews will be posted at my new blog, and I also live-tweeted Jesus Feminist because reading it just inspired me so much. Please continue to comment or email me or DM me on Twitter if you'd like my new blog url and personal Twitter handle.